Yessiree, today’s the day! I woke up extra early to finally apply for my Social Security I.D. card, a process that took me about an hour. Surprising–in a good way–considering the other stories I’ve heard. As a reward to ourselves for completing our morning agenda, my mom and I stopped by Starbucks on the way home. She knew that I’d been waiting for this new drink, and since she was a fan of Dark Mocha Frappuccino, she was happy to oblige my requested pit stop. One of the first things that I noticed when I approached the counter was the announcement about the buy one, take one promo for the new drinks from 2 to 5 pm today. Of course, my initial reaction was: “Dang, should I just come back later?” (That was past nine in the morning). Then I figured it was too much effort. Besides, I wasn’t about to drink two of those drinks in one day when I hadn’t even tried them to begin with! And there’s the GERD factor to consider. So I scratched that idea and went ahead and ordered my much-anticipated Dark Mocha White Chocolate Pudding Frappuccino (hereafter referred to as DMWCPF ’cause the names too darn long). Reaction 1: It’s pretty pricey. Reaction 2: The name says it all. 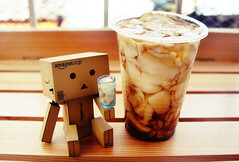 Before I went into tasting my drink, I took my sweet time admiring it and taking the token photos. The line between frappuccino and pudding isn’t quite as distinct as it’s made to be in the ads, but that’s fine. I was happy to note that the barista didn’t scrimp on the pudding. And as for the taste–uhmm. I’ve got to be honest; it left me underwhelmed. It’s not because of any failing on Starbucks’ part. After all, the drink is exactly what it’s advertised to be: Dark mocha frappuccino with white chocolate pudding. It’s like with those tea places wherein you can order add-ons such as pearls and flavored jelly. 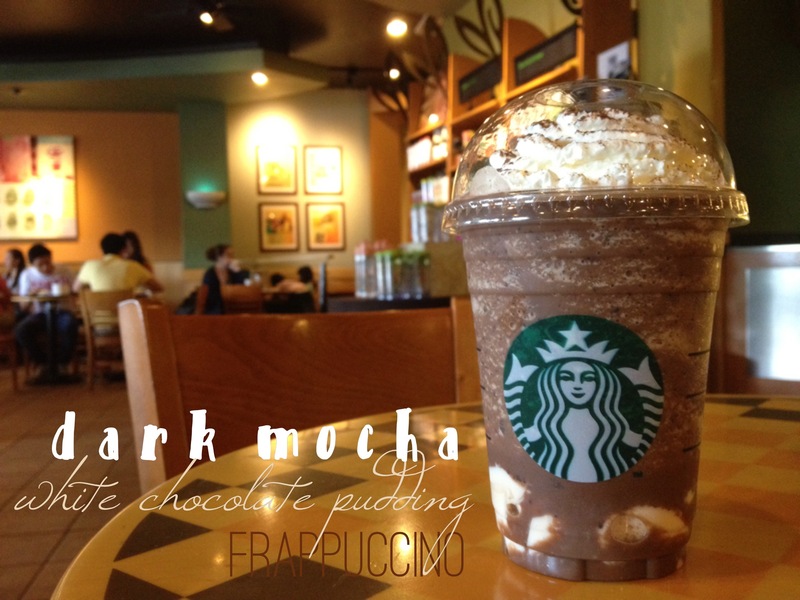 The white chocolate pudding does add an interesting texture to the drink, its silkiness contrasting with the java chocolate chips of the frappuccino. It actually reminded me of taho, a local snack which mixes soft tofu, sago pearls and sweet syrup. Throw in some pearls, and DMWCPF’s the chocolate, slightly coffee-ish, version of taho. Reaction 3: Tall’s big enough for me. It’s more of a revelation, really. When it comes to ice blended drinks, I think tall’s just the right size. I finished my grande DMWCPF in two sittings, the second in the afternoon. It’s definitely satisfied my craving for chocolate, and then some. The Verdict: The quest for the ultimate frappuccino continues. If you love your chocolate and your sinkers, you’ll love the DMWCPF. 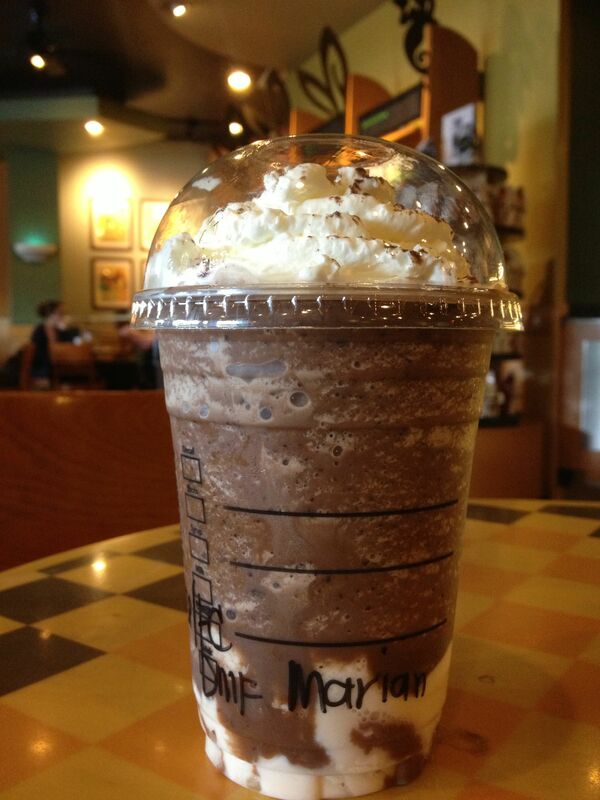 It’s the ultimate chocolate indulgence…but it’s not the drink to convert me back into a Frappe-aholic. I guess what I’m looking for from Starbucks now is another Salted Caramel Mocha moment–one that’ll start a new trend OR make me go oooh. You know what I mean? Until then, I’m looking forward to trying a different coffee chain that’s just opened near my old office. Deets on that to follow! *P.S. 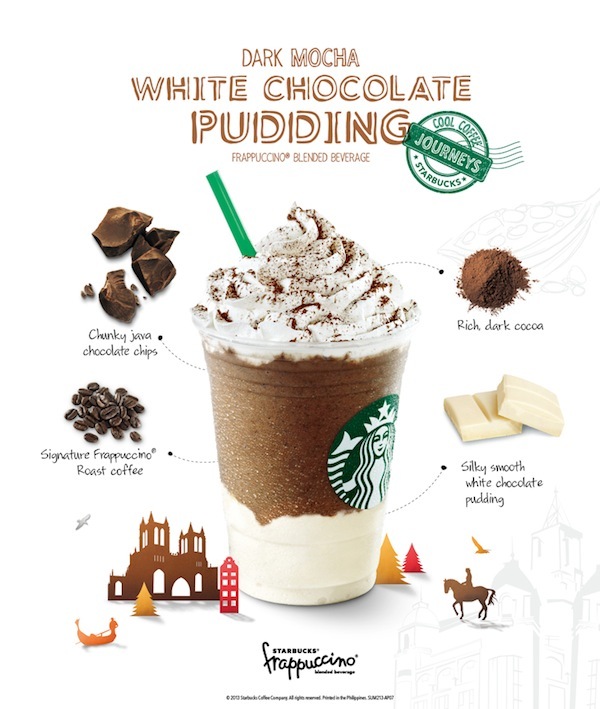 Starbucks also features Green Tea White Chocolate Pudding, at prices P10 less than its Dark Mocha counterparts. These drinks will be available until September 9 only. I’m waiting for a red velvet Starbucks drink! Hmm that might be interesting! I don’t know exactly what I’m waiting for, basta something different and unexpected! I know, I expected more 😦 I hope they feature a good, unique drink next time! Hi, Elijah! So sorry for the delayed response; I’ve only returned to my blog now. Haven’t heard of The Dark Side Frappuccino, but I’ll ask the baristas if they can whip it up. Thanks for the reco! Where are you from, if you don’t mind my asking? Hope that frap isn’t a local offering!